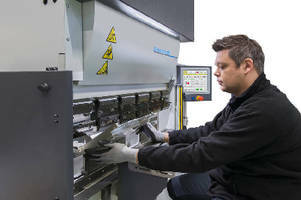 Portable Electric Press Brakes offer 24-ton capacity. Suitable for small parts, Dyna-PressÂ 24/12 can handle bend lengths up to 1,250 mm. Rapid acceleration and deceleration of electrical servo-driven ram delivers bending speeds up to 25 mm/s. Coupling of ram and servomotors is realized through 2 heavy-duty ball screws to distribute force and tonnage evenly. Featuring 1,140 x 1,760 mm footprint, Standard model has 12 in. touchscreen, while Plus model offers TOUCH-B Lite control that letsÂ user create and simulate 2D designs on 15 in.Â touchscreen. For more information, contact Strippit, Inc. 12975 Clarence Center Road, Akron, NY 14001, USA. Tel. 1 (716) 542-4511, Fax 1 (716) 542-5957, e-mail: marketing@strippit.com or www.lvdgroup.com.